Here is my contribution for The Diva Challenge #232, audio 2 and 1. 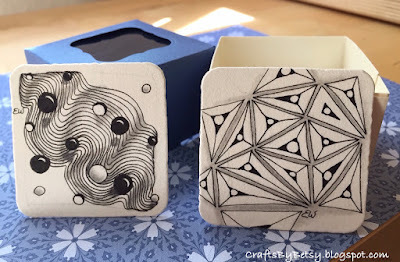 And a glimpse of my handmade bijoux box. That was fun! Very realistic shade on Nipon tangle. GORGEOUS!! I adore how your black pearls are floating... wonderful cast shadows! Both tiles are a delight to look at! Thanks so much for participating and trying out the audios! I love your Nipa!!!! Gorgeous! These are done so very well.